1.Instead of asking the generalized question of “When did you know you wanted to be writer?” I wanted to ask if you vividly or vaguely recall any early story ideas during your childhood? If so, what one story idea did you have? 1. It seems like I was always making up stories for my own enjoyment. The earliest memory I have of that involved a writing assignment in third grade. We were supposed to write a book report, but instead my submission was a complete rewrite of the book?s ending. Sadly, the teacher made me do the assignment over. 2. What particular writers consciously or unconsciously inspired aspects of your story? 2. I think I was most inspired by the S&S writers I enjoyed as a young adult (Howard, Leiber, Moorcock). I’m not sure how much of that bleeds through into my own writing, but mentally that?s where my stories begin. 3. After reading through your story, were you able to note any unintended themes which unknowingly crept their way into the story? 4.Was the impetus of your story a dream or a hypothetical situation? If not any of these, could you describe the beginning stages of the story? 4. It began with the situation: an unsuspecting person caught up in a political/quasi-religious drama. The idea that the main character would have the ability to manipulate shadows also came very early. But I didn’t know he would be an assassin. That came later when I borrowed some aspects of a novella I’d written some years before. 5. Do you utilize music as a means for story inspiration? Meaning, do you play certain songs, while writing, in an attempt to enhance a certain emotion or bolster the effect of a specific scene? 5. I do listen to a lot of heavy metal while I’m writing. Perhaps that had something to do with the energy of the fight scenes. 6. About assassins, what type of research was involved in helping to form the story? 6. Did I actually kill a few people to see how it felt? No, believe it or not, hit-man jobs are hard to come by. Maybe it’s the economy. As far as research, I rely mainly on my imagination. I mean, I’ve been studying martial arts since I was a child, but beyond giving me some perspective on what it is like to be in a fight they don?t really lend much to the equation. 7.I’ve been working in juvenile corrections for fourteen years, so I have a sliver of insight into the criminal mindset. And I stole some gum from a store when I was nine years old. Besides that, no. Interviewing real-life murderers doesn’t appeal to me. I don?t think they deserve that much attention. 8. Here’s a lighter question that does involved too much depth; What’s your favorite movie overall? 8.I’m a big fan of movies, so I’m not sure I could choose just one. Does the original Star Wars count as a single movie in three parts? 9.My favorite books are: Anna Karenina, Lord of the Rings, Stranger in a Strange Land, and The Black Company. I could talk all day about any of them. 10.The Conventional question that involves being the Yoda of Aspiring writers: What tips would you offer any aspiring writers? 10. Be fearless. Read everything you can get your hands on (especially in your chosen genre, but outside it as well). Write everyday. 11. 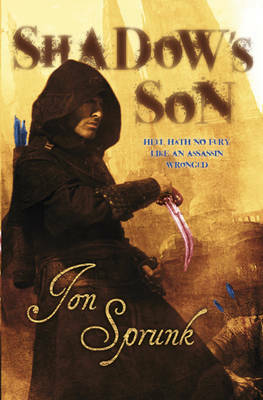 Can you offer us the basic premise of the upcoming sequel to “Shadow’s Son?” Will it involve a greater number of assassins? More specifically, will there be more intriguing explorations into Caim’s psyche? 11. The sequel, Shadow’s Lure, will take Caim back to his homeland in the north, where he’ll learn how far the Shadow’s reach extends. 12. For the final question, this will be the product of my unconventional way of thinking. Could you describe to us concisely how a Valek (from Maria V. Snyder’s Study series) and Caim would play out?